When you create an online store your first aim is to make your brand popular so more customers buy from your site. However, the ecommerce world is ruthless and to achieve this in the midst of cut throat competition from other online websites is not as simple as setting up your online store. So what is the the way out? How can you make your brand shine and sell better in the online market? Yes, spending thousands on SEO and advertising can improve your traffic but this too will take at least 6 to 9 months to show any results. How can you reach out to a wider customer base and make your products popular right from the beginning? The answer is simple- Opt for marketplace integration and start selling on popular marketplaces from day one of your business. 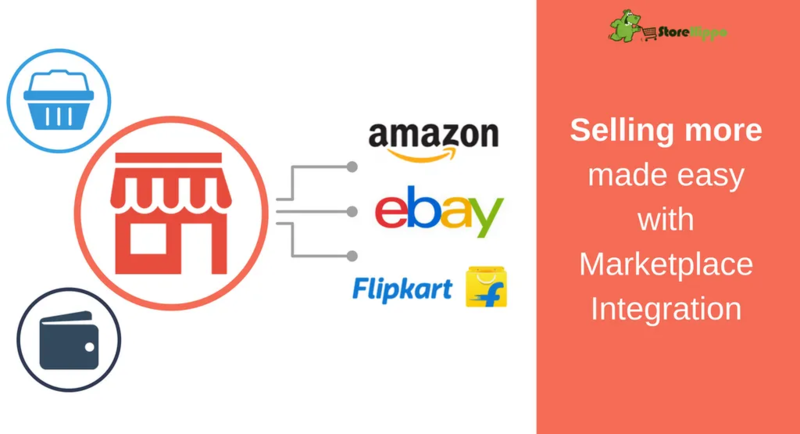 Selling on popular marketplaces like Amazon, eBay, Flipkart makes it easy for you to reach out to the voluminous traffic these platforms attract. It provides you an additional channel to sell your products apart from your own website. You can also integrate your website with more than one marketplaces using a reliable and simple marketplace software to start selling better right from the start of your online business. Thanks to the popularity of the marketplace you can spend a lesser amount on advertising and gain better ROI from it. Allotting the same fund to promote and market the products of your online store would not bring can seldom bring you the same traffic and conversions as that on a marketplace. You can benefit hugely from the brand reputation of the marketplace. If you are using Amazon integration and selling on their marketplace you are also a representative of Amazon. Even if you are a newcomer in the market and offer good products and compatible pricing your products might win over competitors and bring instant recognition for your brand. Listing on a reputed online marketplace helps you win new customers and allows you to build a longstanding relationship with them. The customers who buy your products are actually buying because they perceive your items as a product of the marketplace. This helps in connecting better with the customers and they also keep coming back to purchase your range of products. Apart from this they spread your brand’s name by word of mouth thus making you popular and driving traffic to your site as well. When you sell on Flipkart Amazon and other marketplaces you get new opportunities to attract foreign customers. Overseas customers are especially interested in handmade Indian products, fashion, homeware and other organic and Ayurveda products which are available at affordable prices. By creating a comprehensive product list you can easily tap the overseas market through the popular popular marketplaces. The benefits of selling on marketplace are huge. However listing on them individually and managing the products, orders, inventory, shipping etc can become cumbersome if your web store is not powered by a top ecommerce platform that supports easy integration with multiple marketplaces. Keep watching this space as we bring for you Storehippo unique marketplace integration that will allow you to sell on multiple marketplaces and keep your sales counter ringing.